We’re back! 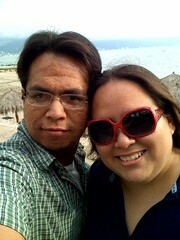 Here we are on the beach in Puerto Vallarta after our first dinner at the resort. This beach was right off the resort and we saw it every night when we had dinner there (as well as during the days when we jumped in). We had a fabulous time and I will post a real update about it soon. I have tons of pics that I need to organize, upload, and scrap. The only ones online right now are the ones that I took with my phone. We went to a “Fiesta Mexicana” which is totally touristy and oh-so-fun. Took a bus tour through areas where buses don’t seem to belong. Took a boat tour which included snorkeling and swimming at a beautiful waterfall. Spent a day at “El Malecon”, aka the Boardwalk. We are now fractional owners at the Mayan with a smaller debt than we had with our timeshare but with greater trading power and eventual cash in our pockets. I am trying to go back and read the past week and half of LJ posts, but it is ridiculous. Help me out by linking me to important, funny, personal, not-to-miss eljay posts that you or other flisters posted because I really do want to read them. And if you have any not to miss news (we were so not watching any news), like, you know, OJ getting busted for robbery in Vegas or Britney having another melt down, feel free to share. PS: I have Artemis, my comp back! I am still installing everything and catching up on all sorts of things. 10 Responses to "We’re back!" Welcome back! You’ve been missed! Can’t wait to see pics, and I hope you had a relaxing time! Thank you for the wb! Sorry it took me so long to comment back. I hope you are enjoying the plethora of pics and posts! Looks like the weather was good! Hope it lasted. Missed you. I’m glad you had fun and hurray for being home! Yay! Glad you’re home and that you had such a good time. Can’t wait to see the pictures.